Hello, good morning to everyone. Today I just have to show you some lovely (and rare) butterflies that were visiting our garden. They are Richmond Birdwing butterflies. These are on the endangered species list, due to habitat destruction. A lot of work (planting host plants for their caterpillars) has been done to bring the numbers back again. We have some of the vines planted along the fence. 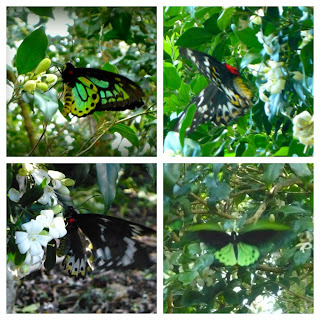 The top left photo is the male, and the top right is the female. They were all enjoying a morning sip of nectar from the mock orange (murraya) flowers. So lovely to see them visit around this time every year. It's always lovely to see butterfly's in the garden, so pretty. These are delightful. Their colours are stunning. How lucky are you to have them visit. Wow! A lovely post! I love butterflies! Your pictures are beatiful, glad to see you back! Aren't they gorgeous? I saw a blue harlequin beetle today at Mainly Music and was stunned by it's irridescent blues. You can't beat nature's colours! Oh they are just lovely!! thinking about you! Just beautiful Sandi...I haven't noticed anything like that here! Hi Sandi, I'd never seen nothing like that. Here we only have white an yellow little butterflies. LOVE butterflies! Thanks so much for sharing!